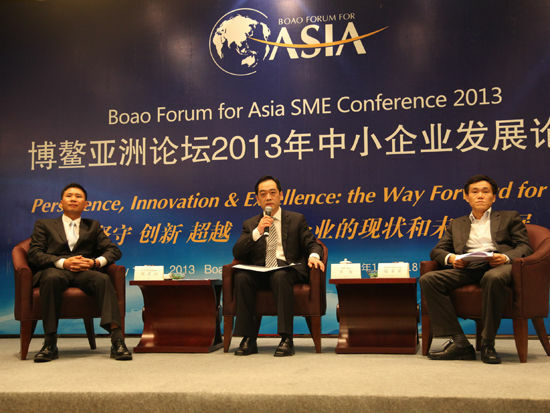 The 2013 Bo’ao Forum for Asia SME Conference kicked off in Bo’ao Town of Qionghai City, Hainan on Jan.17. Nearly 1,000 delegates, including academics, entrepreneurs and government officials from China, Russia, the United States, Japan, Korea, Australia and the ten ASEAN countries attended the Forum. During the conference, attendees held in-depth discussions on sustainable development, the attraction and retention of talent, and the development status and prospects of SMEs, and put forward many constructive suggestions. The Executive Director of Bo’ao Forum Wu Jun expressed that the development of SMEs had always been an important concern of the Bo’ao Forum since its establishment, and that SMEs were facing problems of survival and development. He said that the three keywords of the Bo’ao Forum, Persistence, Innovation & Excellence, were the way forward for SMEs.